If you're in the market for a new Apple Watch, you've come to the right place – we've got the very best Apple Watch deals to get you tapping away on your wrist in no time. 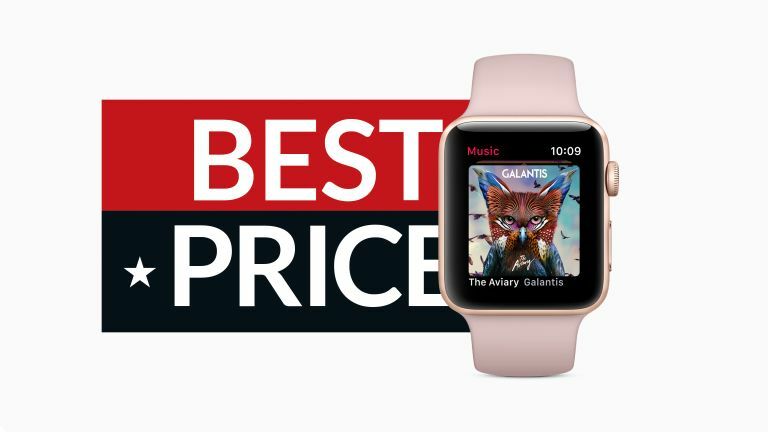 You've also come to this page at the right time, because you can expect some epic discounts on Apple's smartwatch at the moment. Apple is continuing its push into the watch market with Apple Watch Series 4, which sees a new design and impressive life saving features added to the mix. Each Apple Watch is available in either 38mm and 42mm or 40mm and 44mm varieties. Which Apple Watch should you get? If you're looking for the best best Apple Watch, you'll want the Series 4. It's the latest and greatest for a number of reasons. It's got a new display which stretches to the edge of the device, and vastly improved health and fitness features. If you're looking for a slightly cheaper model, you could go with the Series 2 or Series 3. Both the Series 2 and 3 are water resistant to 50 metres, both also have a faster dual-core processor and GPU, and a brighter display compared to the original Apple Watch. Crucially, with the Series 3, there’s built-in GPS, which can measure routes, pace and distance when you’re out on a run or hike without needing an iPhone – often a criticism of the first Apple Watch. And be aware that the Series 1 isn’t the oldest Watch rebadged, it does have the better dual-core processor inside. You can pick one up for a very low price now. Announced alongside the iPhone XS Max at Apple's September event, the Apple Watch Series 4 is the first time the design and size of the Watch has changed since it was first released. Along with that design change comes a bigger size of screen that reaches closer to the edges, a slightly thinner body, and a potentially huge new heart sensor. As this is the newest Apple Watch model deals might be hard to come by. The biggest update to the Apple Watch Series 3 was a cellular connection, enabling you to use the smartwatch free from an iPhone or Wi-Fi network. You'll even be able to make voice calls over cellular, again, without an iPhone present. This is really useful for people who use their Apple Watch for running, and hate taking their iPhones with them – you'll even be able to stream music from Apple Music. As the Apple Watch Series 3 is now the last generation we can expect some pretty serious discounts. If you're looking for an Apple smartwatch, and aren't fussed about having the latest model, the Apple Watch Series 3 should be the one to go for. The Apple Watch Series 2 saw a big update to the Watch internally, even if it remained largely unchanged on the outside but has now been discontinued in favour of the Series 3. Still, that means there will be some good deals on it. Exactly the same housing as the original model but boosted with a dual-core processor and comes with watchOS 3 out of the box. Apple clearly thought the original needed that extra bit of power for tasks so it’s a welcome change, but you don’t get as many options as you did with the very first Watch. Apple has partnered with Nike to create the Apple Watch Nike+, a range of runner-oriented models. So here are the best Apple Watch Nike+ deals.